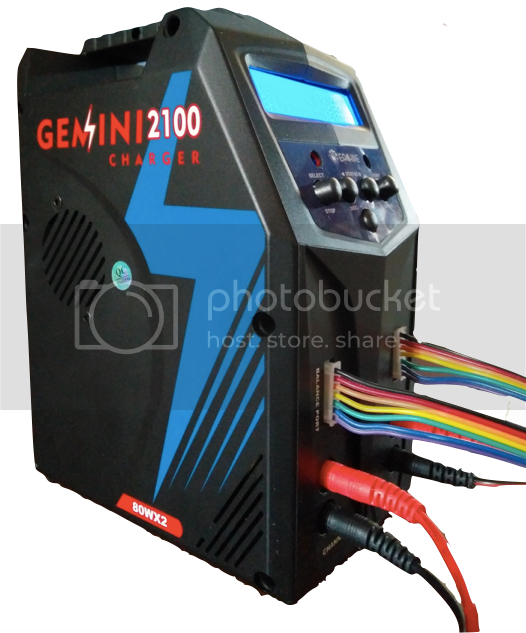 RC India RC Equipments Batteries and Chargers Topic: Eachine Gemini 2x80W Charger review. After using it for a bit, I have found the following to be the pros and cons of this charger. Twice as much power as a standard 4-button charger. Very simple interface. Anyone who has used a 4-button charger before will have no trouble with this. Nice form factor making this charger compact and portable. 2 independent charging circuits letting you simultaneously charge different battery chemistries, cell counts etc. Mediocre build quality. The sticky buttons seem to be a common issue and the misalignment of the case halves doesn’t make this charger look very good.My charger also came with two internal connectors unplugged. The biggest letdown for me – no LiHV support. I’ve been wanting to pick up some LiHV packs for a while now but neither of my chargers support it. A small tweak in the firmware to allow charging up to 4.35V per cell would really make this charger a winner (if the build/ QC issues are sorted). No extra adapters included (such as JST or even a servo plug for my Tx pack). I have posted the complete review as well as details of how I repaired the buttons on this charger on my blog. I will also be testing it with the LM35 temperature sensor and will update this post with my results. EACHINE CG023 FOR SALE !!! !